This burette has a transparent acrylic body and a leak proof stopcock fitted with self lubricating PTFE plug. It measures up to 25ml and in 0.1ml increments. You use a burette to measure fluid volume of combustion chamber to work out the compression ratio. Use paraffin Or turpentine substitute with a bit of auto trans fluid (ATF) to give it some colour. You measure the volume with the piston at TDC to the bottom of the plug hole and use this measurement to get your un-corrected compression ratio. Kit includes various sized end clamps to temporarily fix a broken cable, and 2 lengths of cable of fresh cable. The original Valve Grinding Paste. Supplied with both fine and course in one double- ended metal tin. This Is The Stuff You Use To Seal The Exhaust Slip Joints On 2 Stroke Exhausts. It's High Temperature Properties And Flexibly Make It Perfect For Sealing Racing 2 Stroke Exhaust Flanges / Slip Joints. Very good adhesion, permanently elastic: Adheres to different materials such as metals, coatings (eg, cathodic dip coating), plastics, etc. 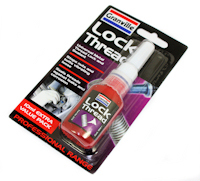 This Silicone Sealant Is Perfect For Jointing 2 Stroke Crankcases Together On. It Is Oil Resistant Yet Stays Flexible And Also Able To Stand Temperature Up To 200 ° C.
We Feel It Is The Perfect Sealant For Motorcycle Engines. Wurth Silicone Special Is A Cold Vuicanising Silicone Rubber Gasket Jointing Compound. Permanently elastic siIicone sealing compound For sealing of surfaces, gaps and cracks on water pumps, oiI sumps radiators, crank cases etc. Bridges large, uneven surfaces, Gives a reliable seal, withstanding many years of vibration. Excellent adhesive properties.Will not drip, sag or become stringy. Excellent chemical resistance. Permatex Ultra Grey is designed for high torque applications requiring a unique RTV gasket, ultra grey exceeds manufactures performance requirements. Suggested Applications: Two stroke crank case joints, clutch cover gaskets, base gaskets, water pump joints, power valve covers, inlet manifolds, timing covers, thermostat housings. Now Includes A Pointed Nose For Accurate Use. 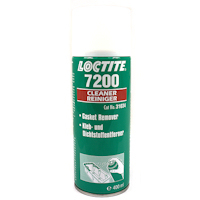 Great at removing old or excess Loctite 3020 from engine cases also removes most old instant gasket sealant and set hard glue paper gaskets. 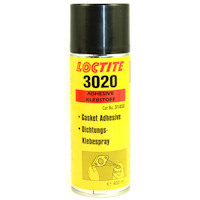 use on metals and gaskets. Ensures a gas tight seal and Resists vibration use on all joints from manifold to tail pipe. 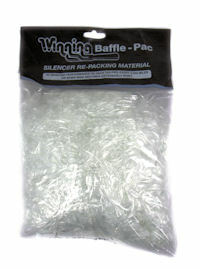 Silencer Repacking Material For Both 4 Stroke And 2 Stroke Exhausts Silencers. For Fly-Wheel Ducati - Suzuki 50 And For Disassembling Puch - Minarelli - F. Morini Clutch Body. It Has A M27x 1.00 LH External Thread That Fits Most Japanese Engines Like RD125LC RD350LC ETC. This puller has a 26mm external RH thread with a 1.00 pitch. Vespa 50 Primavera, Vespa ET3, Vespa PK 50, Vespa V90, Vespa Primavera 125. It also fits into the aftermarket Newfren Clutch Hubs. It has an internal thread of M26 x 1.00mm Pitch, The Outside Diameter Is 28.90mm. 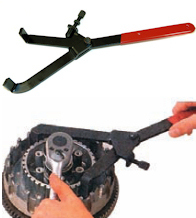 Tool Made By Italian Motorcycle Tool Company Buzzetti. 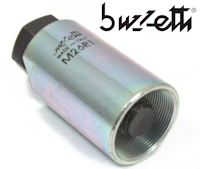 A very useful to have in your workshop and being made by Buzzetti you know you are getting a quality motorcycle tool. Flywheel Puller with a RH Internal Thread Size Of 26mm X 1.0mm. Fits Ktm 250, 300 two stroke with electric start, ktm: 250 rfs, 250sx-f, 400, 450, 520, 525. Please check that the tool is correct for your engine. 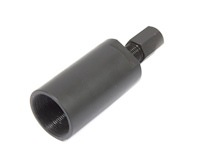 Flywheel Puller with an Internal Thread Size Of 28mm X 1.0mm. Essential Tool For Removing the generator rotor off your engine. Please check that the tool is correct for your engine, may fit other models. Flywheel Puller with an Internal RH Thread Size Of 30mm X 1.0mm. Also fits older Bosch, Femsa, and Motoplat ignitions, on Maico, Ossa, Penton, Puch, Sachs, Zundap, and other Euro mini bikes. On Vintage bike applications, always measure flywheel thread diameter, thread pitch and thread direction before purchase. 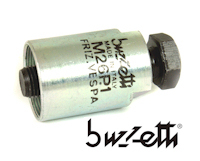 Buzzetti Part Number 5324, Replaces OEM tool YM-04141 Essential Tool For Removing the generator rotor. Flywheel Puller with an Internal RH Thread Size Of 32mm X 1.5mm. Buzzetti Part Number 5332 Essential Tool For Removing the generator rotor. Flywheel Puller with an Internal RH Thread Size Of 35mm X 1.0mm. Flywheel Puller with an Internal RH Thread Size Of 38mm X 1.50mm. Fits Kawasaki KLX400A/B 2003 Suzuki Burgman AN400 2007 On, Suzuki DRZ250 01-07, DRZ400 All 00-12. Buzzetti Part Number 5343, Replaces OEM tool Suzuki Part Number 09930-31921 Essential Tool For Removing the generator rotor. Buzzetti Part Number 5336, Essential Tool For Removing the generator rotor. Flywheel Puller with an Internal RH Thread Size Of 28mm X 1.0mm. 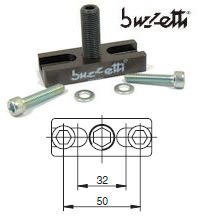 Buzzetti Part Number 5345, Same Tool as BUZ5319 But This One Comes With The Thread Crankshaft Protector. Essential Tool For Removing the generator rotor. Buzzetti Part Number 5381, Essential Tool For Removing the generator rotor. This is a Universal plate type flywheel puller. The Outside Diameter Is 93mm It Is 9.50mm Thick, The Pin In The Centre Has A M16 Fine Pitch Thread And Is 106mm Long. 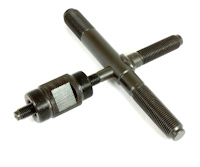 Buzzetti crank case separator tool. Equipped with 3 M8 screws and 3 M6 extensions. User capacity from 22 to 120mm from the centre screw.